This article covers germ cell tumours, often abbreviated GCT, which classically arise in the gonads (ovary, testis). 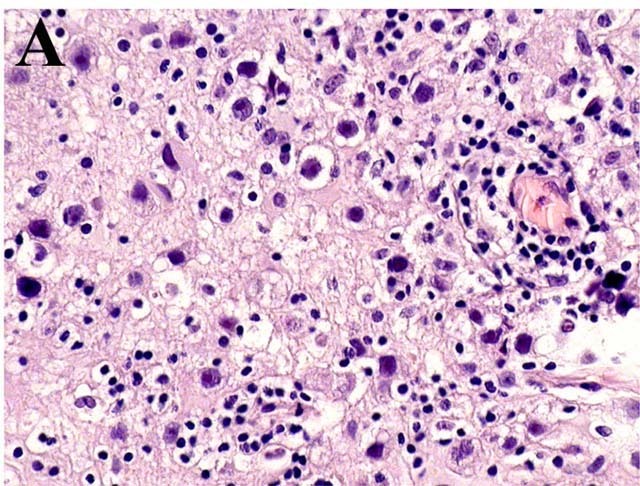 They are also found in the midline and make appearances in neuropathology (e.g. pineal gland) and in the mediastinum. Yolk sac tumour (endodermal sinus tumour). Mixed germ cell tumour (mixed GCT) - 60% of GCTs are mixed. teratoma + embryonal carcinoma + endodermal sinus tumour (yolk sac tumour) (TEE). 1 cm2 of tumour per cm of maximal tumour dimension - guideline for testicular cancer. AFP - yolk sac tumour. Alpha-inhibin -ve (+ve in SCST). Calretinin -ve (+ve in SCST). Isochromosome = one arm (p or q) is lost and replaced with a duplicate of the remaining one. Example: isochromosome p12 = chromosome 12 where q is lost and two p arms are present. Is the generic version of this tumour. It is found in the midline (brain, mediastinum). A common GCT in males. A common GCT in females. ↑ URL: http://www.uroweb.org/gls/pdf/10_Testicular_Cancer.pdf. Accessed on: 30 October 2012. ↑ 3.0 3.1 Amin MB, Epstein JI, Ulbright TM, et al. (August 2014). "Best practices recommendations in the application of immunohistochemistry in urologic pathology: report from the international society of urological pathology consensus conference". Am. J. Surg. Pathol. 38 (8): 1017–22. doi:10.1097/PAS.0000000000000254. PMID 25025364. ↑ Miettinen M, Wang Z, McCue PA, et al. (March 2014). "SALL4 expression in germ cell and non-germ cell tumors: a systematic immunohistochemical study of 3215 cases". Am. J. Surg. Pathol. 38 (3): 410–20. doi:10.1097/PAS.0000000000000116. PMID 24525512. ↑ Zhou, Ming; Magi-Galluzzi, Cristina (2006). Genitourinary Pathology: A Volume in Foundations in Diagnostic Pathology Series (1st ed.). Churchill Livingstone. pp. 538. ISBN 978-0443066771. ↑ Carver, BS. ; Al-Ahmadie, H.; Sheinfeld, J. (May 2007). "Adult and pediatric testicular teratoma.". Urol Clin North Am 34 (2): 245-51; abstract x. doi:10.1016/j.ucl.2007.02.013. PMID 17484929. ↑ Looijenga, LH. ; Oosterhuis, JW. (May 1999). "Pathogenesis of testicular germ cell tumours.". Rev Reprod 4 (2): 90-100. PMID 10357096. ↑ URL: http://ghr.nlm.nih.gov/handbook/illustrations/isochromosomes. Accessed on: 15 February 2012. ↑ URL: http://path.upmc.edu/cases/case525.html. Accessed on: 25 January 2012. This page was last modified on 14 December 2016, at 10:50.